Mango pudding is a popular dim sum dessert. This dessert has a delicate flavor of mango and its texture is silky rich and smooth makes it popular in most Chinese restaurants. I bought a litre of mango sweetened puree last week from the ingredient supplies store to make a Mango Mousse Cake (here) and used the remaining mango puree to make this simple Mango Pudding for my family and friend to serve as an after meal dessert. Easy to make this yummy dessert with few simple steps. Please read the recipe below. Add (A) in a large pot and use hand whisk to stir till liquid to boil and sugar dissolved, off heat and cool down the liquid a little. Pour (B) mango mixture into (A), stir well and pass through a sift. Then add in (C) continue to stir with hand whisk till ice melted. Add in egg yellow coloring and mango flavor. Pour mango liquid into cups or molds and add in some fresh mango cubes. Put in refrigerator till mango pudding is set. Hi Ann. Thanks for sharing this recipe. Could you please advise how to make this recipe with agar-agar as a substitute? As I can’t have gelatin for vegetarian diet. Hi Kristie, This recipe is not suitable to use agar agar as there is fresh cream in it. 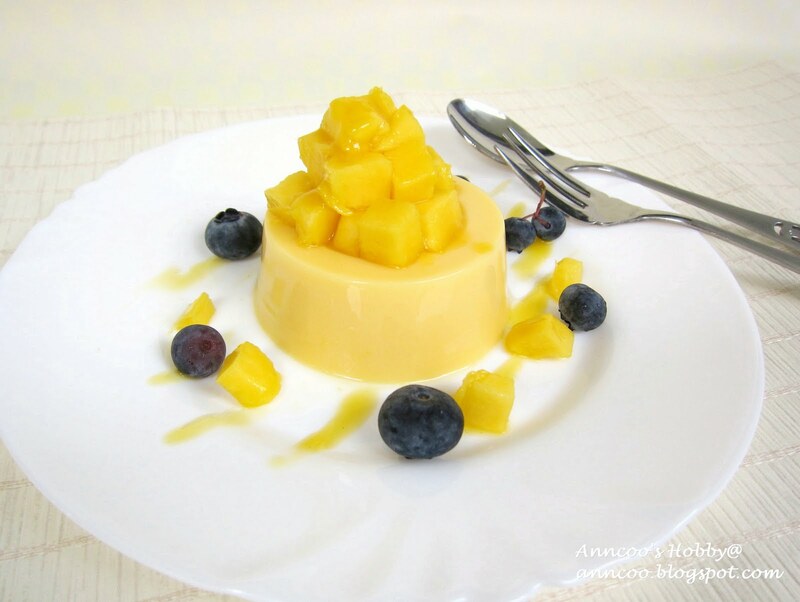 You may like to check on my mango agar agar jelly recipe. Hi Ann. Thanks for your reply. This jelly looks so pretty. Where can I get the mould for this? 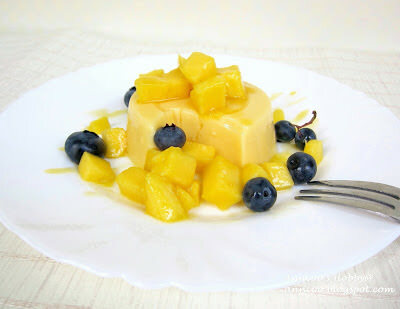 Hi Kristie, please check the link to get the mould in the Mango Coconut Jelly recipe..
May I know if you are using the sweetened or unsweetened mango puree from Phoon Huat and also can the fresh topping cream be replaced with whipping cream (President Brand)? Hi Helen, I bought the sweetened mango puree from PH. If you want to use whipping cream then you've to add more sugar because the cream is not sweetened. Noted with thks. Fresh topping cream from PH is it the same as "Red Man Whip Topping"? Is it a better choice than whipping cream when using for cake frosting ? Also it is sold in one liter carton box, how should it be stored and for how long? Yes, In PH is Red Man Whip Topping Cream for frosting cake. Whipping cream is also cooking cream or mixing with chocolate as ganache choc cream. I usually wrapped the whole box with a plastic bag after opened. Please leave your name in your next comment. Hi Ann, Sorry forgotten to leave my name. My question is where do u store the unused cream, is it in the chiller or the freezer and can it be kept till before the expiry date stated on the box or must it be used up asap after opening? Thks for yr patient and time to read my question. Hope to hear from u soon. Hi Helen, You can store the whip topping cream in the freezer. I usually wrapped the unused one (already opened) with plastic bag in the chiller. Can last for about 10 days. You can also whip up the cream to peak form and store it in the freezer too. Thank you for your advise. Will try to make the mango pudding once I got hold of the cream. I feel like a bit of a stalker everytime I go through old posts but gosh do I LOVE this mango pudding!! I'm a mango junkie so anything involving mango is like HEAVEN. And this looks amazing and easy to make. Thank you very much Friends for your nice words. I love mango; this is such a delicious way to use it. I must remember this to try; bookmarked! I love anything mango. Positively my favorite fruit. Your mango pudding looks especially attractive with adding the blueberries. Love the contrast of the colours. Gorgeous dessert with wonderful flavor. Drooling!!! Soooo attrative , still have? Ann this looks so refreshing! I want this now , it's 95 degrees here in NYC…thanks for the recipe my sisters would love this! Love mango pudding! I remember I last had them 10 years ago….I am bookmarking the recipe to try. Thanks, Anncoo. I must to make this over the weekend. So yummy! Usually I just use premix pudding powder. Mango pudding is a great dessert to end dim sum with, always leaves me satisfied. I really like that it isn't to sweet and overpowering like a lot of other desserts. Thank you for sharing this wonderful simple recipe Ann. Love this! I always order this at dimsum restaurants! May I know what is fresh topping cream? Could you please post a picture on how it look like. The picture of the topping cream is in Banana Chocolate cake. I will try this out soon. Thanks for sharing! This is one dessert that I need to learn how to make…..very nice! What a pleasant recipe with such an appealing presentation. I love desserts based on Mango. On a serious note – It goes well with the fresh mango cubes. Love this, love anything with mango. At the dim sum place in Canada, it is served with evaporated milk or cream. Due to the gelatine issue for halal diet, I made this and used a combination of konyaku jelly powder and agar-agar. I also did a mix of mango and orange. Love your touch of blueberry there! Mango pudding is my family's most favourite dessert. I'd definitely make some in summer. This is a beautiful and delicious dessert especially for this time of the year here. Wow…you can buy mango puree at the stores? Yes Biren, mango puree is available all year round and it is imported from Thailand or Philippines. love just about anything with mango in it, but the cool creaminess of pudding is always tops! Great dessert! Ann! I was gonna make mango pudding tomorrow! But I was thinking of using Baking Mum or Quinn's recipe. Now that I saw yours, I think I might just use yours, thanks! Oh my, this is really mouthwatering! And I am lovng the mangoes too. I'm drooling, babe. Enjoy your day, dear. this is surely one of my favorite! un pudding à la mangue qui est riche en saveurs!!! So did you tried any desserts in HongKong? We have imported mangoes all year round and anytime when you're here I can make this for you. That is simple and yet its so nice.